Probably, it sounds blasphemously, but I do not like iPaq, though I respect this brand. Perhaps, Compaq Company managed to do the thing, which the others tried unsuccessfully - to create an image handheld computer. A computer focused on the elite audience, and high price is caused basically by brand, image of the manufacturer company, thought-out design. Though, for the sake of justice it is necessary to note, that iPaq models always have been in advance from their colleagues on the product niche. Undoubtedly, the first, that is evident - changed trade mark on the forward panel of handheld computer. If earlier, down to model 3970 there flaunted the name "Compaq", now - victorious "HP". Certainly, we feel sorry for deserted by now "Jornada" brand, but HP has made a correct choice, the choice for a benefit of solvent clients. Because of the parents change, the design has also changed, but sufficiently thought over: on the one hand it, undoubtedly, differs from the earlier one, on the other hand, all the basic features are kept. That's like "that" design, but modified, and improved. Calculation is made on the preservation of the general model line style and on the old, checked up users who have already got used to certain forms. The left top corner of computer is decorated with thick and short aerial, giving rather significant kind to the device. Top black plastic "cap" became a little bit graceful, and now there are three light-emitting display diodes: for Bluetooth, WI-Fi and the third, not used yet, probably for any special needs … Managing buttons and joystick have also hardly changed their places, probably to give a place for the finger print scanner - to the main peculiarity of the 5455 model. Joystick did not become more convenient - it became less and now is designed, mainly, only under graceful fingers, as, however the scanner. I do not know what for, but during several years Compaq assiduously ignored such useful things to the user as replaceable basic and reserve batteries. HP has corrected both defects. 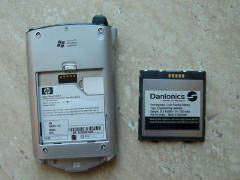 Li-polymer accumulator with 1,350 MAh capacity, 3.7 V, is used as the replaceable battery. Soon, probably, the strengthened variant of the battery in capacity of 2,500 MAh will appear. 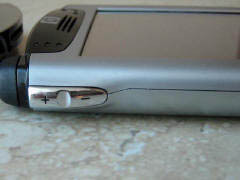 The reserve battery is inaccessible to user and, as against habitual standards, capable to support service ability of the handheld computer within several minutes at the moment of the basic power supply change. Under the battery, as well as in any self-respecting cellular telephone :-) is the place for SIM-card. But there is no software in 5450, "sharpened" under a cellular telephone - it's a privilege of the future products. One of the new iPaq features - charge through USB cable. On the one hand, we, undoubtedly, already have seen it; on the other hand, at the program level nobody still has made similar things. In the case with iPaq it is clever settings which make the device susceptible to voltage on USB-port. A pleasant fact is, that 5455 model without ceremony works with expansion jackets from the previous iPaq models, so there can be more occasions for the next upgrade. Probably, it is one of the basic features of 5450 model. Truly a quite good thing, really working. Thus to the person, who did not read the instruction, it is necessary to tinker, before he finds where is latent the scanner's software. And it settles down in the standard inset "password" in the options panel. Training can borrow some time, depending on the fingers amount that you want "to remember". It's possible to remember all the 10. Probably, it is useful in case you work on Yakudza where for faults it is accepted to pay cutting off fingers. For training of the computer, each finger is necessary to lead the specified body on the scanner up to 5 times, and to not hurry up. The main thing is that, both the procedure of training and the process of password use are sufficiently interactive and clear even without reading instructions … After training the computer will open dutiful, obeying the print of any of the scanned fingers. 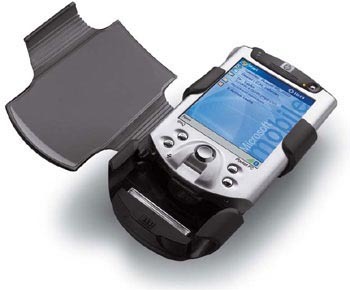 Perhaps, the prints scanner will make iPaq popular among corporate users, in particular, storing the confidential information in the handheld computers. First, it is really reliable: the password "does not fall down" even after rigid reboot, and, secondly, it is simply more natural, than input of a numerical code - you should not take stylus, to remember the password - you pass the finger over and that's all. 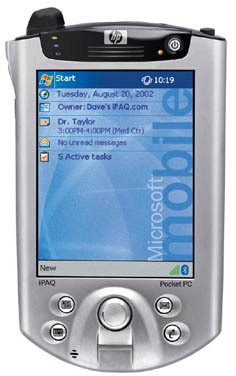 Among handheld computers consumers, perhaps, 5450 model has the maximum of communication opportunities that makes it attractive both for simple users and corporate markets. If Bluetooth and infra-red communication - are the throughout user formats, intended for creation of a local network within the limits of a small apartment or a separate individual, Wi-Fi or 802.11b - wireless Ethernet - more serious thing, demanding the professional approach, points of access and intervention of programmers or web designers. It is necessary to tell about it especially, because there are a lot of changes. In spite of the fact that the speaker is located in the top of black panel, as well as in previous models, the microphone has moved downwards, creating, along with the slot for SIM-card surprisingly a fertile soil for communicator. It would be desirable to hope, that it’s business of software - hardware opportunities are available! The socket for headphones has settled down below now, as the place at the top was occupied with the aerial of wireless communication. Thus, except for headphones, it can perceive external microphones. The button which in early models of iPaq answered only for the beginning of the record now has turned into the swing and manages the sound: pressing plus increases loudness, a minus - reduces, and pressing in the middle - makes active a dictaphone. Perhaps, the last feature about which would be desirable to mention - vibration alert, earlier, being the privilege only of cellular telephones, and now, gradually consolidating the positions, migrating in handheld computers. It activates on the dropping out menu - "bubble" of loudness adjustment. Few words about other hardware opportunities of iPaq 5450. 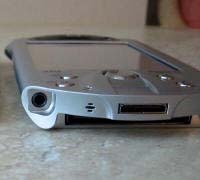 Intel PXA250 (400MHz), 64 Mb of RAM, 48 Mb Flash ROM, the transflective screen with backlight , till now one of the best, among handheld computers, SD slot with SDIO (SD in/out) function, memory which allows besides cards to use also periphery in SD format. All these characteristics - more or less standard set of the advanced pocket computer, being added with all basic kinds of wireless communication, the scanner of finger prints and the thought over design make this handheld computer by the doubtless the leader of the market, a computer precisely focused on the broad audience of users, the competent product qualitatively made and, that the main thing, is skilful positioned in the market. So Hewlett Packard has managed to keep and increase great achievements of Compaq in the field of pocket computers, my applause!